Delirium, a manifestation of brain organ dysfunction, presents acutely with impaired attention and disorganized thinking, and imposes a high degree of caregiver burden. Delirium can occur at any age, but occurs more often in older adults due to their increased vulnerability, affecting more than 2.6 million individuals in the United States each year (i.e., more than 5 individuals every minute) (U.S. Department of Health and Human Services, 2011). Typically following acute illness, hospitalization, or surgery, delirium often leads to loss of independence, cognitive decline, and increased morbidity and mortality. Moreover, delirium is associated with excess health care costs of >$164 billion per year (Inouye, Westendorp, & Saczynski, 2014; Leslie & Inouye, 2011). Delirium can be difficult to detect and manage and is receiving increased attention in the medical literature (Lee et al., 2017; Steis & Fick, 2008; Wilber & Ondrejka, 2016). Many factors, including cognitive impairment, infection, dehydration, and psychoactive medications, are predictive of delirium (Inouye et al., 2014). In most cases, delirium is multifactorial, which makes finding effective approaches for prevention and treatment highly challenging, and research studies methodologically complex. Importantly, delirium can be prevented with a multidimensional clinical strategy (Hshieh et al., 2015). Despite its importance, delirium is not well understood and vastly underrecognized. Fundamental advances in diagnosis and treatment of delirium are lagging. The pathophysiology of delirium remains poorly understood, and there are no biomarkers to serve as diagnostic indicators or therapeutic targets (Davis et al., 2017). Although the number of measures for screening and diagnosis of delirium has increased in the past decade, the proportion of patients with unrecognized delirium remains high (McCoy, Snapper, Stern, & Perlis, 2016; Morandi et al., 2017). In November 2016, a team of delirium experts led by Sharon K. Inouye, MD, MPH, Professor of Medicine at Harvard Medical School and Director of the Aging Brain Center at Hebrew SeniorLife's Institute for Aging Research, was awarded a $3.7-million grant over 5 years. This award is the first of its kind from the National Institute on Aging/National Institutes of Health and is intended to build an interdisciplinary collaborative network of delirium researchers nationally and internationally. Dr. Inouye, along with 12 interdisciplinary experts in delirium research, will create the Network for Investigation of Delirium across the U.S. (NIDUS) and beyond to foster collaboration and accelerate scientific discovery in delirium. NIDUS will unite delirium researchers from 27 organizations across the United States in focused collaborative efforts. NIDUS takes an interdisciplinary approach that includes many medical specialties, nursing, social work, rehabilitation, cognitive science, neuroscience, epidemiology, biostatistics, and related fields. NIDUS comprises two research cores and three task forces. The Research Resources and Database Core, led by Edward R. Marcantonio, MD, SM, Pratik Pandharipande, MD, and Thomas G. Travison, PhD, will develop a database of ongoing delirium studies to encourage collaboration and secondary analyses of existing data. The Measurement and Harmonization Core, led by Richard N. Jones, ScD, and Dale M. Needham, MD, PhD, will develop resources to help researchers choose tools for assessing delirium and delirium severity. The three NIDUS task forces, Pilots and Innovation, Mentorship and Career Development, and Dissemination are further described in the Table. The NIDUS network provides structured activities for interdisciplinary delirium researchers, including scientific symposia and delirium research boot camps. NIDUS is offering pilot grant opportunities (Table) and providing information and resources on delirium, which can be accessed at https://deliriumnetwork.org. The kick-off for presenting NIDUS to professionals will occur at the American Delirium Society (ADS) meeting in Nashville, Tennessee on June 6, 2017. This will be an opportunity to meet and talk with NIDUS investigators and learn first-hand about the exciting opportunities, resources, and activities through the cores and task forces. The ADS meeting is June 4–6, 2017, and registration information is available at https://americandeliriumsociety.org/ads-2017. Another key activity of NIDUS is the annual Delirium Research “Boot Camp,” where researchers with a passion for delirium research can apply for the 2.5-day intensive training session in delirium research. The Boot Camp is intended for delirium researchers across disciplines—either newly entering the field or changing research directions—who have previous training in the fundamentals of clinical research, with the goal of enhancing the cadre of trained scientists focusing on delirium. Accepted applicants will be expected to submit a specific research proposal and will be paired with a NIDUS mentor. The study of delirium is complex and methodologically challenging, and the Boot Camp provides approaches to help address some of these complexities. The Boot Camp will be held November 1–3, 2017, in Boston, Massachusetts, and will include interactive training in delirium assessment, mock grant review, individual methodological consultations, and didactics on the latest updates, biomarkers, neuroimaging, electrophysiology, and mixed methods in delirium research. Travel grants are available to selected applicants. The application can be accessed on the NIDUS website at https://deliriumnetwork.org. We have reached a pivotal moment where the importance of delirium is gaining traction among scientists, clinicians, and the general public. Approximately 1 year ago, the iDelirium group and website (access http://www.idelirium.org) were established. iDelirium is a federation of international delirium organizations advocating for delirium with a unified voice, which launched the inaugural World Delirium Day on March 15, 2017. Although there is growing awareness of its importance, many large gaps remain in the scientific understanding of delirium and implementation of best practices into clinical care. 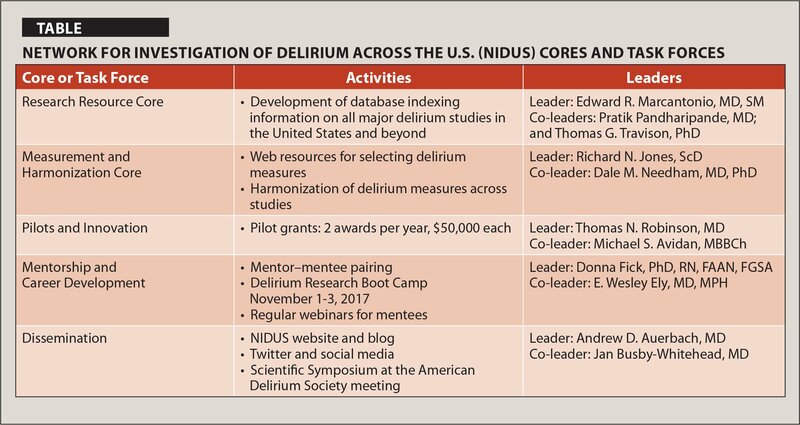 Although not directly affiliated, the NIDUS scientific network complements the work of iDelirium by helping address the many gaps and challenges in delirium science, establishing a research infrastructure and databases to increase collaboration among delirium researchers globally, and helping mentor the next generation of interdisciplinary delirium scientists. The need for additional research on delirium is compelling and urgent. Clinicians and researchers across fields are encouraged to join the broad range of interdisciplinary experts in delirium research as leaders, scientists, and innovators. Together, we are working to advance the field of delirium, with the ultimate goal of improving clinical care for this common and devastating condition. The authors have disclosed no potential conflicts of interest, financial or otherwise. The NIDUS Network is supported by the National Institute on Aging (grant R24AG054259 [S.K.I.]). This work is dedicated to the memory of Jane Ann McDowell for her lifelong work in delirium. Editor's Note: This editorial will also appear in the Journal of the American Geriatrics Society (doi:10.1111/jgs.14942).